This marks the second week of Thursday cards at Canterbury Park, and the selections from our group are now available. 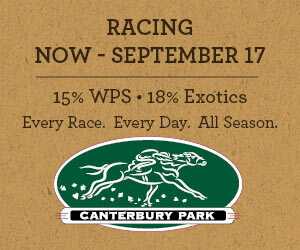 Canterbury Park has added a pick 5 to their wagering menu starting tonight. It is a normal pick 5 wager, not a jackpot, and the takeout is 18%. The pick 5, which is a 50-cent base wager, starts in race six tonight.